This is a sponsored post by Crayola and My Blog Spark. All opinions and ideas are my own. My little "Mini-Me" is an artist and crafter at heart. He always has been. Ever since he was little, he would rather sit on my lap and work with me than watch TV or play video games with his brothers. In fact, I usually had to set up an extra spot at my work table with his own tools to make "stuff" with or I'd never get anything done. I love his artistic spirit. We never worried about what to get him for a long trip, or for his birthday, or as a special treat....it was always artistic toys. When we got ready to move, I must have thrown away or donated a BAZILLION crayons and art supplies. I was not going to have that go with us. I am going to be organized and careful when I got to my new home. Only a few days into our move, I found a problem already. I hadn't kept any supplies for the or 3 days of traveling or the 2 month hotel room stay after. 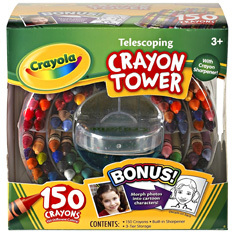 But I didn't want to go buy a box of crayons that would get smooshed or lost within hours. We were given this WONDERFUL art supply case to try. Can I tell you how much I absolutely LOVE it?!? It has enabled "Mini Me" to let out his artistic side in the small confines of the hotel room. I don't worry about crayons everywhere, because everything fits so nicely in the case. He can carry it down to the lobby and color to his hearts content. He can sit on the bed and stay out of the way to make pictures for his grandparents. And he has even been known to try and sneak it to church so he can color during meetings. 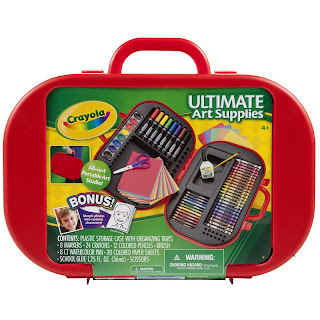 The Ultimate Art Supply Kit contains 24 crayons, 8 washable broad line markers, 12 colored pencils, 8 washable watercolors, 1 paint brush, school glue, scissors, and colored paper...everything your budding artist needs to create beautiful masterpieces in "little bitty living space!" 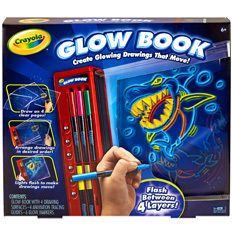 But I wish I had seen this Glow book when we had that party. It would have made a great party favor, giveaway for the games, or alternative for the paint all over everyone. I just love how all 3 of my boys like to go into the dark bathroom in the hotel and make all kinds of neat and fun pictures. The book comes with markers that work on the special pages to let them draw cool scenes that glow and become "animated". The hours of use, and lack of arguing, made this book an amazing addition to our hotel stay! I know it will get lots more use since it was a favorite with all 4 of the kids. Crayola also gave us this Jewelry boutique. I'll be honest, we haven't opened and used this gift yet. I was worried about pieces everywhere, but I'm super excited to place it in my craft room and try making some jewelry with it. Is that wrong? I guess that just goes to show you that Crayola is great for all ages! I've never been much of a jewelry person until I went to Utah and saw my cute Sister-in-law making her simple outfits outstanding with cute jewelry. Since I'm so cheap and don't like to buy things if I can make them myself, I'm looking forward to trying the Jewelry Boutique out myself. 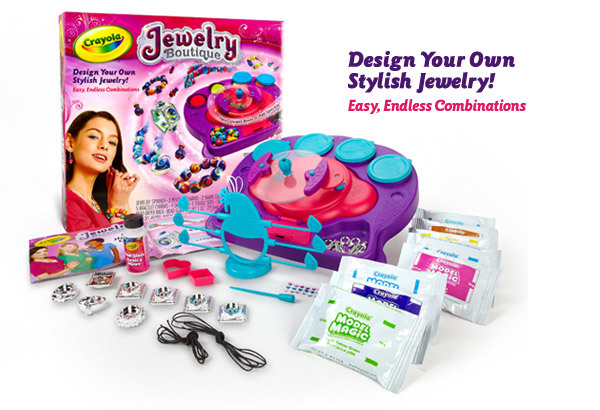 The Jewelry Boutique kit includes 8 packs of Crayola Model Magic to mold 160 beads, 5 bracelet charms, 3 pendant charms, 2 shape cutters, a bead dryer rack, 5 toggle sets, 4 earring posts and ear wires, a bead punch, 18 gems, 2 necklace cords, 1 elastic cord, and bead glaze. That should be enough to get me started and hooked! 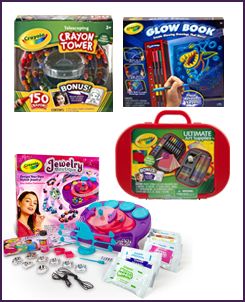 And to help you have a creative Christmas holiday, Crayola has given me a set of these 4 products to give to you! Merry Christmas!! To be entered to win, let me know what your favorite crafting tool is. Get an extra entry by becoming a fan on of our facebook page and then coming back and letting me know! I'll randomly draw a winner out of all the comments on Sunday morning! My hot glue gun is my nemesis and my best friend when crafting! I love when kids show an interest in crafts. So much fun to see what they come up with! My favorite crafting tool is the Internet. Perfect for inspiration. my oldest daughter's favorite crafting tool is finger paints! You didn't say which Sunday morning you would pick a winner - only kidding. I wish I didn't miss this terrific giveaway. I got sidetracked with my granddaughter's 6th birthday this weekend. She would have loved these prizes.